This letter is from Susan Wekesa. Eric Kisiangani, whom she mentions, attended the Six-Week Workshop at Ecology Action in 1990 and later became the Director of Manor House Agricultural Centre in Kitale, Kenya. Last year he moved on to develop his own GROW BIOINTENSIVE® project, Rural Technology Centre, on his small farm at Mabusi. I am basically a tiny farmer. I came here to Mabusi village of Kakamega district in 1993 following the clashes that displaced my family from our former home at Chukura in Uasin-Gishu district of Rift Valley province. The ethnic clashes made me lose my 10-acre family land, 5 head of cattle, houses and other property that had taken me years and years to acquire. The loss of these things caused my hope and that of my children to evaporate from our bodies. I was reduced to nothing. Luckily enough, I managed to purchase 0.3 acres of land here with the help of one of my son’s savings. A place for members of my household to have their graves when we die was all I needed. A year later, towards the end of 1994, a Mr. Eric Kisiangani was introduced to me by one of our neighbors at our newly-found home, Mabusi. At this first meeting I was struck by the intensity of Eric’s humanity and his dedication to improving the welfare of poor farmers and conserving environment. Over the course of time, Eric and I became friends, and my respect for his integrity and ability grew. 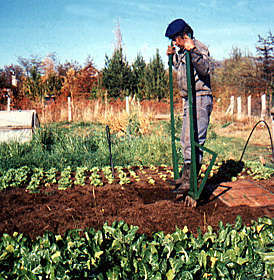 Each time he visited my family he taught us one or two aspects of GROW BIOINTENSIVE mini-farming, including double-digging, compost, offset planting, and natural pest control techniques. On May 13th, 1995, Eric asked me if I could accompany Konambaga Women’s Group to Manor House Agricultural Centre for 1-week course. When I was there at Manor House, I learned several things reinforcing what Eric had taught me. The lessons I had from Manor House and those that I continue to receive from Eric and his colleagues at Rural Technology Centre have moved my household from misery to normal rich life comparatively. My small “shamba” is producing surplus which I sell for income. Last season, April to June, I earned Kshs. 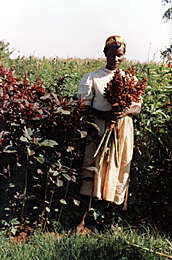 15,000 (U.S. $268) from sales of Sukuma Wiki (similar to tree collards). My 0.3 acres of land is producing plenty and healthy vegetables that bring money to knock at my door in the wee hours of the day. I mean, people come knocking at the door of my house before 6:00 a.m. wanting to buy vegetables. Apart from food and money for my family, I am able to fertilize my soil from material that it produces and supports. GROW BIOINTENSIVE has recreated hope in me and my household. I can now face the future proudly. Morris is one of the teachers in the first group sponsored by Kilili Self-Help Project at Manor House. He applied what he learned by sprouting seeds from grapefruit he got at the local village market and has created an orchard of 1,000 trees, all grown GROW BIOINTENSIVEly and thriving. What is outstanding is the fact that there was not enough water in his area to grow citrus — until he began using GROW BIOINTENSIVE practices which use water three to eight more times effectively! The Duncans, who have reached their seventh decade, live in Palo Alto, a suburban city south of San Francisco. They are long-time friends and supporters of Ecology Action, and Adrienne has taught classes at Common Ground Store. Gene and Adrienne Duncan live on 1/5 of an acre - most of it taken up by their living space - and raise almost all of their own food year round. Their pantry gleams with preserves put up by Gene - many of them experimental combinations - and the freezer is full. When they moved to their house, over 35 years ago, Adrienne put in fruits that would follow one another in succession so that they can have fresh fruit year round, with careful storage. 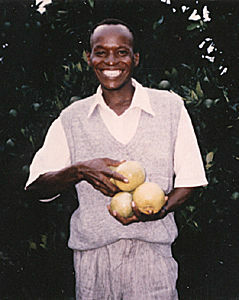 Their grapefruit tree produces fruit with a very thick skin, which keeps well - enough for one every day of the year. Other fruits fill pies in their freezer. Twenty years ago Gene, who is a mathematician, decided to retire early. Part of the plan was to use Adrienne’s gardening skills to grow their food so that they could live on less money. They took classes from John Jeavons at Common Ground Store and used the skills they learned to gradually build a garden that reduced their monthly grocery bill by more than half. 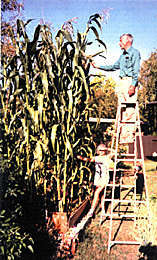 They have been gardening GROW BIOINTENSIVEly for 16 years. When they started, the ground was like concrete with gravel fill and dense clay underneath. They have double-dug the beds each year and used compost, turning their yard into a beautiful, bountiful food-producing area. Over the years the beds have become more and more productive and now give them three times the conventional yield in half the space. They have enough food, even with all their preserving and freezing, to give surplus fruit and vegetables to kitchens for the homeless. Nine healthy chickens are housed in a coop Gene built. The Duncans feed them garden leftovers as well as pellets and cracked corn. Adrienne says that lettuce is what gives the yolks their rich orange color. Their three compost bins are also in the chicken house. The third bin, with compost almost finished, is under the chicken’s roost. The manure drops into the bin for easy collection, and then is aged. The Duncans make their compost of garden clippings, leaves and grass. They use chicken manure now instead of steer manure. Adrienne says that you never know what steer manure may contain. Adrienne’s grandfather was ‘a clever, good farmer, who beat the system,’ raising touchy crops like celery in upper New York state. He watched the weather carefully and also used his intuition. She has applied the same principles, paying attention to the pattern of sun and shadow in her garden and carefully placing each fruit and vegetable accordingly. She plans the sequence of plantings so that there is a constant flow of food, with seedlings growing in the greenhouse while mature plants are ripening in the garden. Fernando Pia attended Ecology Action's Three-Day Workshop in November 1993, returned to Argentina and started his GROW BIOINTENSIVE Project, and then came back to Willits for the Seven-Day Workshop in 1994. The following excerpt is from a presentation Fernando gave at the Food Security Panel of the International Federation of Organic Agricultural Movements Conference in Denmark in 1996. For over 14 years I have worked in the extension service for the Agriculture Ministry of the Argentine Province of Chubut in the mountainous valleys of Andean Patagonia. This is a place of beautiful cedar forests and pristine rivers and lakes. But for many years the joy of that beauty eluded me: in my work I felt terribly impotent in the face of the suffering I saw. On one hand, very poor peasants (often indigenous Mapuche people) trying to survive on small holdings of overgrazed and eroded land with no available irrigation. This situation was forcing the young people to leave for the city in search of something better. Or, in other cases, entire families moving from farm to town where they settled in marginal neighborhoods working temporary jobs and suffering typically leading to poor nutrition and alcoholism. As an agricultural advisor, I could offer these people little. On the other hand, many young individuals and families were arriving in my region from the big cities of Argentina looking for a better quality of life. They wanted to buy a small piece of land to farm in order to feed their family and, perhaps, earn a small income. Fernando Pia attended Ecology Action’s Three-Day Workshop in November 1993, returned to Argentina and started his GROW BIOINTENSIVE Project, and then came back to Willits for the Seven-Day Workshop in 1994. The following excerpt is from a presentation Fernando gave at the Food Security Panel of the International Federation of Organic Agricultural Movements Conference in Denmark in 1996: come. They wanted to live a more humane life, more in contact with nature. They would always ask me what was the minimum economically-viable agricultural production that would allow them to settle here. The answer was hard: 10 hectares of good land, irrigation, equipment and machinery and a house would mean at least U.S. $100,000. In addition, marketing in Patagonia poses a staggering problem as distances are so great. I could offer these hopeful people very little. I watched the skill base of traditional farming be eroded by increased dependence on agricultural chemicals and commercial seed. Previously a very remote corner of Argentina, recent transportation improvements meant local farmers now had to compete with the influx of chemically-grown foods from the outside. And to do so meant to adopt those outside production techniques. It scared me to think what would happen to locally-grown food supplies when those chemical inputs became too expensive for our small farmers. I often tried to warn the farmers of these dangers and told them of the benefits of organics. But always it was the same reply: ‘I will gladly switch to organics but first show me an example of what you say. Show me a functioning organic farm.’ I didn’t have anything concrete to offer these people. Looking for solutions to these problems, I travelled to California where I participated in a Three-Day workshop called GROW BIOINTENSIVE Food Production, given by Ecology Action. Ecology Action had demonstrated yields of typically four times the U.S. average while utilizing only one-fifth the water and actually improving soil structure and organic matter content. 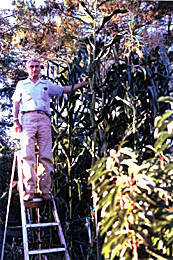 Most important to me was that the method employed only hand tools and was easily practiced by individuals or families. And it was truly sustainable. 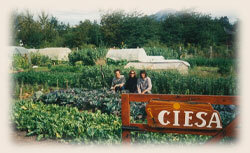 On my return from the U.S. we began CIESA (Center for Research and Teaching in Sustainable Agriculture). And now after 3 years of GROW BIOINTENSIVE practice, I have proved for myself and many associates Ecology Action’s claims. We have examples from over 150 crops we have tested. Given CIESA’s excellent results with GROW BIOINTENSIVE, we are now able to offer farming plans and training which allow an individual working only 35 hours per week to provide between 60% and 80% of a vegetarian diet for a family of 4 and an annual income from farm sales of about $3,500 on as little as 8,600 square feet. This has truly been an answer to my prayers for the Patagonian farmer. In April of this year we began giving 20-hour courses in GROW BIOINTENSIVE mini-farming. Of the first 30 participants, 10 had visited us previously and had already begun GROW BIOINTENSIVE practice on their farms. 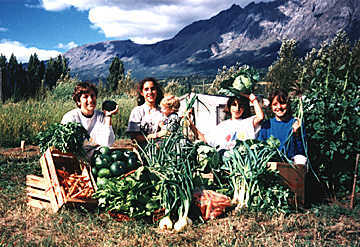 Another three were gardening teachers from rural schools who intend to begin GROW BIOINTENSIVE programs for children. We are also becoming a catalyst for regional capacity building by training apprentices from other communities who will return home and begin GROW BIOINTENSIVE projects locally. We have begun sales of boxes of assorted vegetables delivered directly to homes and are at the point of initiating a future grower’s cooperative. In the future our goal is to reach those who are now migrating from farm to marginal urban areas and provide them with a means of staying on the land. Too, we dream of helping more and more people produce their own food, generate enough excess for sale and thus live on the land with no contamination. We believe that by focusing on sustainable food security we can truly build a better quality of life: better nutrition, better physical and mental health, increased dignity and more time with the family. bottom - Esteban from CIESA staff using the U-bar.